I'm super persnickety. One area of my life where this manifests daily is in the loading of the dishwasher. I like to strategically arrange the dishes and bowls so that every centimeter of space is maximized. I officially do this to save water and energy, but a big reason is because it's just plain fun! I wish my plates were this colorful! Image via SmallNotebook.org, specifically the great post: 5 Tips to Improve Your Dishwasher. Personal quirks aside, there is somewhat of a real science behind loading the dishwasher. 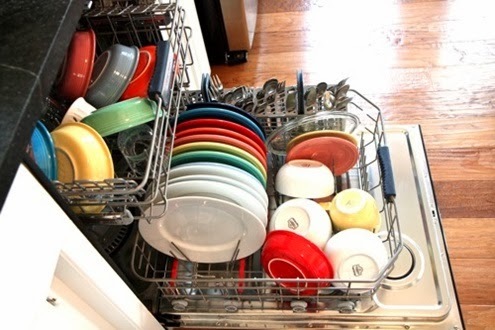 Seventh Generation's blog features awesome tips on how to load a dishwasher. My favorite tip is: "Don't prewash dishes! The enzymes in dish detergent need a place to work, and food particles provide the work site." If the utensil basket is attached to the door, remove it and clean behind it. Also, use an old toothbrush to scrub food out of any nooks. Replace basket. Throw 1 cup white vinegar into the dishwasher. Run the dishwasher on high heat, deep cleaning setting. Sprinkle 1 cup of baking soda over the floor of the dishwasher. Run the machine once again. You've now got yourself a clean machine! I learned this process from Melissa Maker at Clean My Space. Check out her How to Clean Your Smelly Dishwasher video. Don't you totally just wanna hang out with her?! And, cuz I care, here are some non toxic ways to keep stainless steel dishwashers clean and shiny. I use Seventh Generation Automatic Dishwashing Powder. I'm happy to know it scored an A on Environmental Working Group's Guide to Healthy Cleaning. Check out EWG's safety ratings of various dishwasher detergents to see how yours stacks up.